I have always been a big fan of distressed furniture. I love the old, worn look of a piece of painted furniture that shows a bit of the wear and tear of daily life. Waiting 100 years for it to age to this condition is not something any of us have time for. That is why learning to paint and distress your own furniture can be a valuable resource and skill to have. Painting and distressing furniture can be a great way to transform old or dated space. 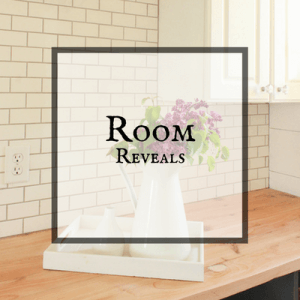 I recently transformed my bedroom furniture….and this is my story. You know those times when hubby is out of town on business, and you decided its the perfect time to paint all your bedroom furniture because you know asking for forgiveness is way easier than asking for permission? Come on, I know its not just me. Well, I am guilty of this. Like. A lot. 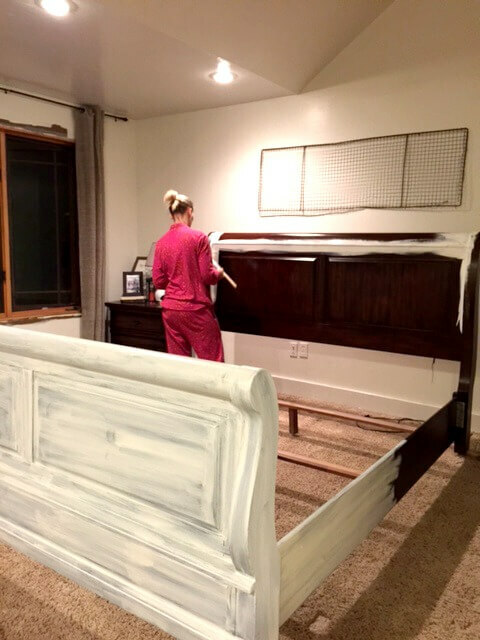 Another great method is telling him you are going to paint the kitchen cabinets, but instead you paint your bedroom furniture and he is so elated to see that you didn’t paint the cabinets, he wont care as much about the bedroom. I’m nothing if not sneaky. A few weeks ago, I did just this. Now, mark my words. I will be painting my kitchen cabinets. But, hubby will need to be gone longer than a day or two. Don’t hate. I really did love the color of my bedroom set. About 9 years ago it was all I could have dreamed of. But, I change, my style changes, it happens. 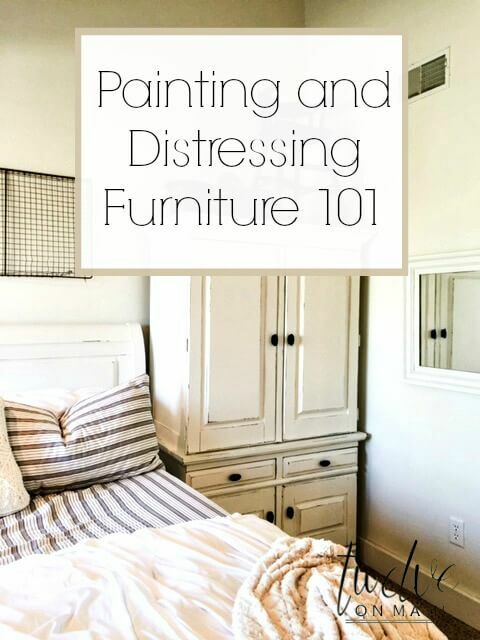 I really wanted to create a post that demystifies the idea of painting furniture. 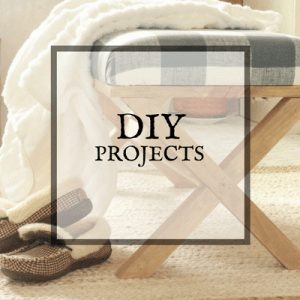 With a few of the right products, it can really be an easy project to tackle. First off, this paint brush is the amazing. This improves the application of the paint. It goes on nice and smooth. The only thing it lacks in is getting into the cracks. For this I use an Angle Paint Brush. I took everything out of my bedroom, took out my mattress, and covered the floor where the bed touches the floor with newspaper, to protect the carpet. I ended up with a big pile of mess in my bathroom. The next step was to clean the furniture well. This step is very important. 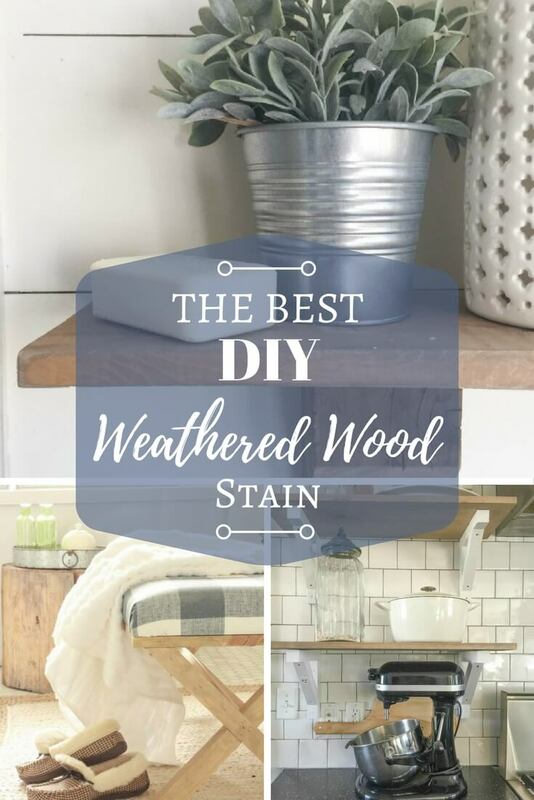 You want to make sure you clean it well so that the paint will adhere to the wood. 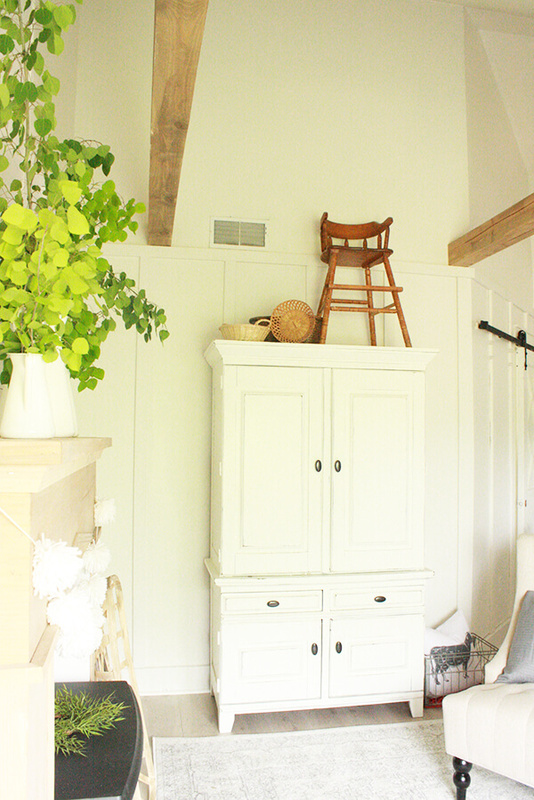 When I had wiped everything down, it was time to get painting and distressing furniture. This is my sister. She came the weekend my husband left and she helped me paint and distress my bed. It was a lot of work so I was glad for the help. We did watch quite a big of Jimmy Fallon while we were painting. It definitely makes the time pass quickly. The secret here is to make your sister do it. Haha, just kidding. But it sure does make it more fun with someone that enjoys doing it too. We started off painting the first coat. I had the round brush and she used the angle brush. The first coat is always the scariest. The furniture will look BAD. You will question why you decided to do this and you will feel pangs of regret. Ignore them…and keep on going, it will get better, I promise. Now I was lucky to have my sister there to help, but keep in mind this does not have to be a 2 person job. If I was doing this all alone, I would have started with the angle brush and done all the corners and cracks that are more difficult to get to. I then would use the round brush for the larger areas. This is after the second coat. Even as dark as my furniture was, it only took two coats and part of a third in certain areas.. While the paint dried, we watched a little more Jimmy Fallon. If I can give you one good piece of advice, this is it. Turn on some good music, or some Jimmy Fallon. It just makes the time pass more enjoyably. I know I said it before…but i will say it again. Here is is the next day after a late night of painting and Jimmy. I ended up sleeping on our mattress in our bathroom. It was quite the adventure and I am sure glad my husband was not around for it. He would not have been amused. Now, the furniture is ready to be distressed and waxed. This is where the sanding sponges and wax come into play. I started by sanding the edges of the doors and most of the raised parts of the furniture. 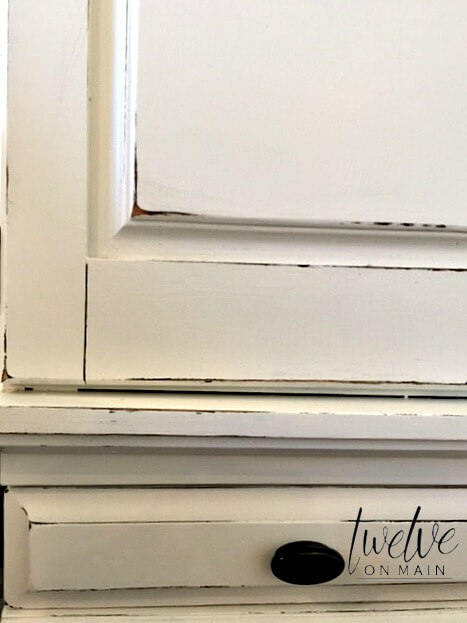 What I like to think about is if this piece of furniture was actually 100 years old, and distressed with age, what areas of it are going to show the most wear. The edges and the raised areas. I start with a little bit at a time. You can always sand more, but I really do not want to have to touch it up with paint because I overdid it on the sanding. 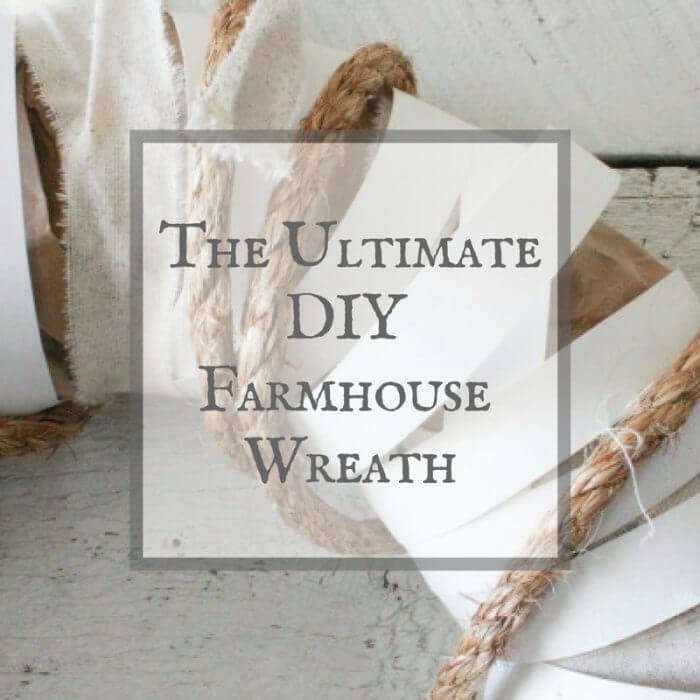 I have used many different techniques to antique and distress furniture including steel wool, a scotch brite pad, chains are a great way to rough up and add dents and dings to a piece of distressed painted wood furniture. I most recently distressed my vintage church pew with my orbital sander….oh gosh it was easy! Check the video out below of how I did it! This video shows just another method that I use to distress furniture. You just have to be more careful when doing it this way, since the orbital sander can really get away from you. I would only recommend distressing furniture in this way if you are comfortable with power tools and have used an orbital sander before. Once I was finished adding my distressing, I waxed all the pieces. I have an extra round brush that I brush on the wax with. By the time I was done applying the wax, it was time to start buffing it. Really this is not so bad. A good, clean rag is all you need. Just start buffing in a circular motion and you will see it start to shine. Once this is cured, it dries to a hard finish. Waxing is the most labor intensive part of finishing the furniture. You have to give it a good rub to get the wax to shine. Painting was easy in comparison…but it still wasn’t that bad. Now, this is where I started to panic. I had to get everything back in its place! Lance was on his way home! Remember, he had been out of town. This is how we work. He doesn’t seem to mind if I do any of my crazy paint projects, as long as it doesn’t look like a bomb has gone off. Maybe I am just fooling myself, but it makes it easier on us both if that aspect of the project is not an issue. I like to see the look on his face when he walks in after being gone for a few days and sees something transformed! He never disappoints! The look on his face is priceless. Its like a combination of amusement, frustration, and resignation. I wondered sometimes if he is reminding himself that he loves his wife….haha! I am totally obsessed with my “new” furniture. It is so pretty. it has just the right amount of distressing and it has brightened up the entire room. The furniture before was pretty, but it was dark, and I really wanted to lighten it up and this made all the difference. I just keep telling myself, he is lucky to have someone that cares so much about his home, that they want to keep it beautiful. He is so lucky, right? Yes, I believe he is. I promise guys, these types of projects really aren’t that bad! This project took me about a day and a half start to finish, and I neglected to tell you we had a full day of birthday parties in between. Really, I only worked on it at night once the kids were under control. I promise, it is doable! Having your husband gone is a bonus though, because then you wont have anyone to harass you about it. This would be a really great idea to use on cheap reclaimed furniture, or something that you have grown tired of, like I did. Check out those garage sales or thrift stores. You are sure to find a piece of furniture that will look amazing painted and distressed. 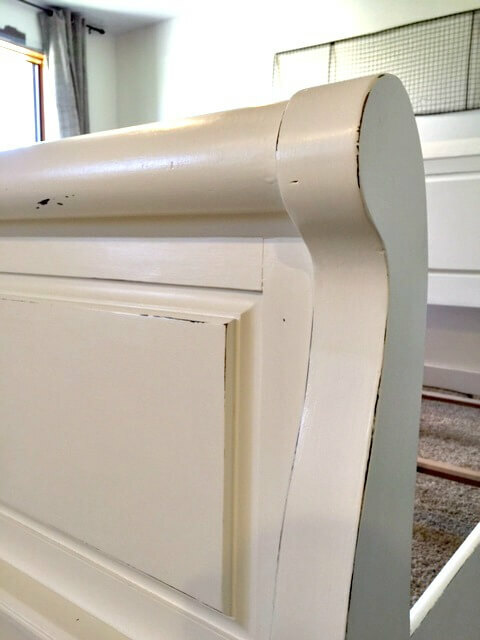 It has been a few years since I painted my bedroom furniture and I wanted to give an update on how it had held up. I have had a lot of people ask if it really held up even though I did not sand my furniture. So, let me tell you…it has held up beautifully. I mean I cannot believe how well it has withstood 4 kids and a large husband that is rough on everything. I only have one spot on the end of the bed, where the kids would climb over the sleigh bed and it got scratched. But, that is nothing. It still looks amazing and I am still so very happy I took this project on. If I had to give any advice that I may have learned over the past few years of living with this distressed furniture…I am not really sure what I would say! It has held up well, and I do not regret it. 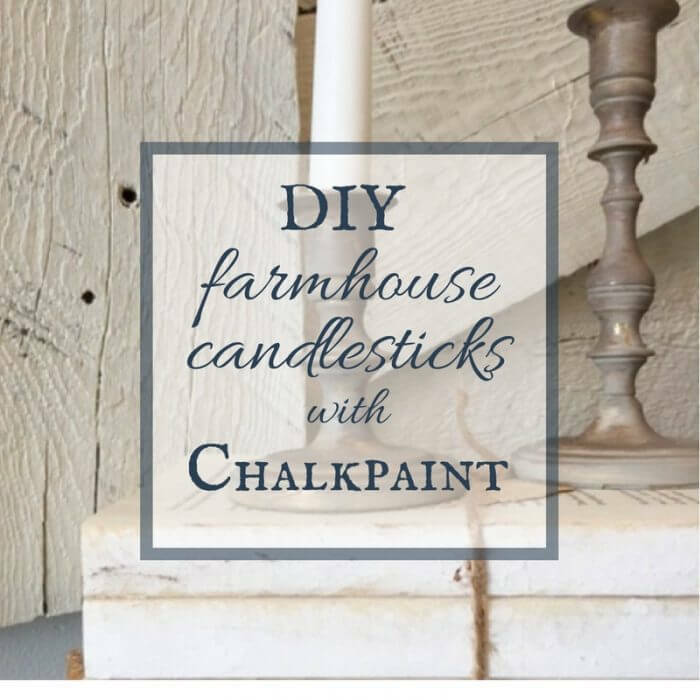 I would say that if you are nervous about making your own chalkpaint, make sure to just purchase a good chalk paint that you feel confident in. 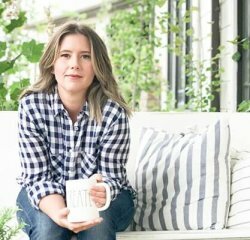 My friend Thea at That Sweet Tea Life is an amazing furniture painter and sells a really good chalkpaint as well as paint brushes on her site. I would definitely check it out…. This project was definitely a success, and I have and will paint and distress furniture again! But, for now I am going to take a break and enjoy my new bedroom set. I am so happy that I am able to share a little bit of my life with you though! Make sure to stop by again soon! I am upping my blog posts and pushing myself into a new blogging schedule for a little bit as an experiment. I am hoping the results are what I think they will be. There is going to be so much Christmas goodness coming your way! Stay tuned! The bedroom pieces look great. You distressed them nicely too. I paint a lot of furniture and I have used several brands of chalk paints, milk paints and latex. My favourite additive for latex paint is plaster of paris but the product you used looks interesting as well. Thank yo Elizabeth! I am quite partial to plaster of paris as well, but I thought I would give this a try. I am sure I will be using plaster of paris again soon! I have not painted any furniture yet and my bedroom set looks just like yours. Can you tell me what brand of paint you used and what brand was and type cause I know there’s so many types of waxes out there. I need specifics on all of this. And also the paint color you chose as well please. I love the look! Thank you! Was the furniture was that you used a clear wax? I’m thinking about repainting and distressing a piece I have to match the island in our new house – our builder left us some paint. Is it important that I use some kind of mixture (like your chalk paint mixture)? What will happen if I do the same steps as above using the paint on its own without any additives? 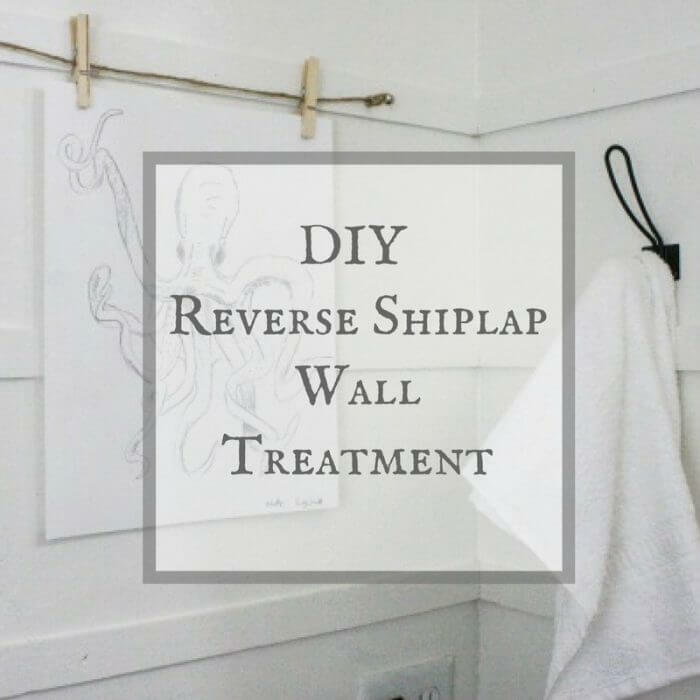 This will work if you dont want to add anything to your paint. 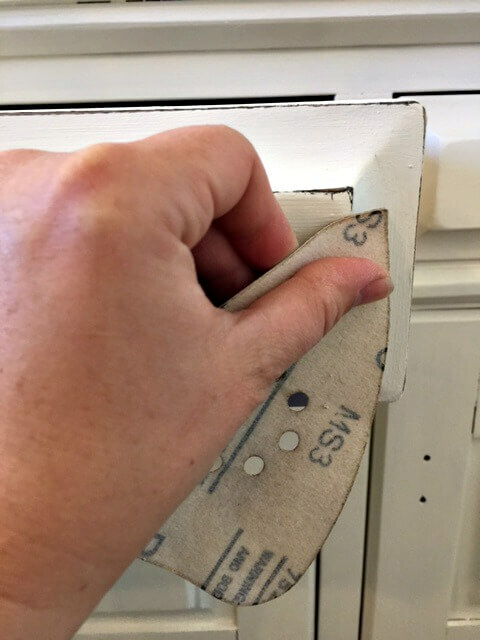 Do you need to use the sander deglosser on furniture pieces that you bought in a store that has finish on them? Thanks Sheri! This just makes my day! Haha! Thats hilarious! A womans got to do what a womans got to do! What brand of wax did you use? Did you cover the entire piece with the wax and then buff or did you do it in sections? I.E. 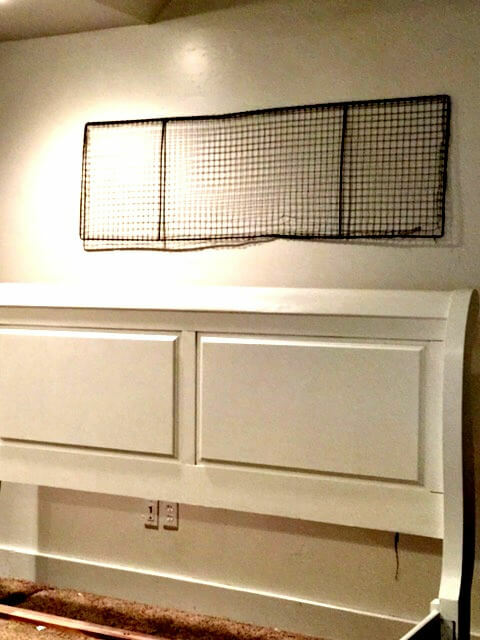 Headboard, footboard and rails. I covered the whole bed at one time and by the time I was done applying the wax I could go back and start buffing the parts I had done first. So … I have a question ? I have agreed to do a bunch of bedroom furniture that has a stain ( oak ish orange stain ) anyway she wants white chalk paint or off white … can I seal the furniture with somthing and then paint a coat of paint that will be under the white? So when distressing it will be seen? What can I seal it with so I don’t have to sand the entire pieces? Any ideas thank you ???? Oh my God! Permission…such a sad story! Enjoy your great looking furniture! Your furniture looks amazing! I did the exact same thing with ours, when my husband got home the room was finished! He loved it. I’ve used paint with unsanded grout and it works great too. So great to hear that! Thanks for stopping by! I love the “new shabby chic look!” Did you do the inside of the armoire also? I have one that I have been thinking about painting. Thanks Vicki! I did not paint the inside. However if I was going to display it with the doors open I would definitely do it! Hahaha! I know what you mean by waiting till the hubs goes out of town. Doing a dresser now but you have inspired me to do my living room set, it has that same brown finish. Can’t wait! And thanks for all the tips on paint and wax. I bought Annie’s a long time ago and it was so expensive I didn’t do anymore projects. Oh thats so great! Good luck with your projects! Good Job I love it. But I would have expected to take a 100 year old furniture with a professional restorer to give it new life. This is not 100 year old furniture:) This is about 10 year old furniture. I definitely would not paint 100 year old furniture! Have a great day! Why wouldn’t you paint 100 year old furniture? Personal preference or logistics? I was looking at your post for ideas for several nice (almost 100 year old) pieces I have that need serious refinishing or painting. Just personal preference really, unless it was absolutely necessary. 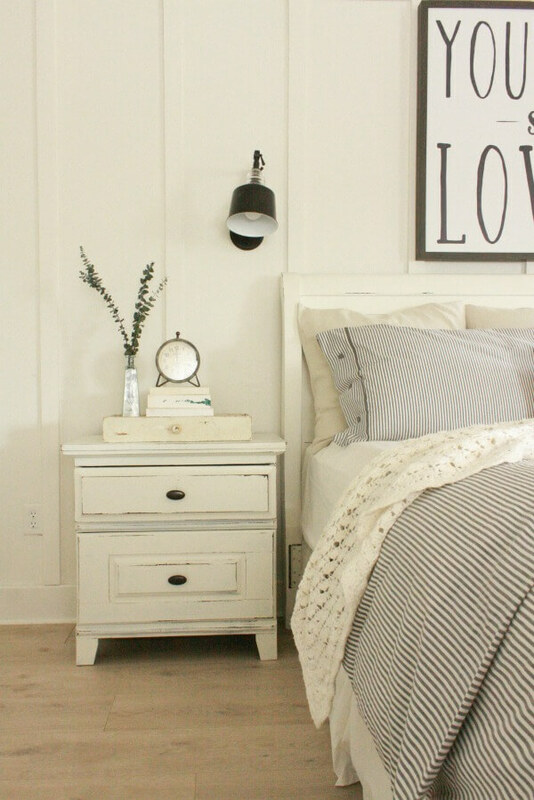 I love your painted bedroom furniture and am thinking about doing mine as well. I was just going to use chalk paint but you mentioned that you mix it with regular paint? I like to mix regular latex paint, plaster of paris, and water. What is the ratio of paint, plaster of paris and water that you use? Thanks. Did you have to sand the furniture’s top shiny coat off before painting? Nope! I painted directly onto the surface! I just bought all the supplies you recommended through Amazon. I have almost the exact same bedroom set and can’t wait to get started. What was the ration you mixed the chalk paint with the latex paint? Hi! Thats great! 1/3 cup plaster of paris, 1/3 cup water and 1 cup of paint! That is the ratio that I use! So how do you paint the parts that touch the carpet without having your sister hold the bed up til it’s dry? ???? Do you ever re-wax your items after an extended period of time? I think depending on the area it is being used. I have not rewaxed anything, but maybe if they got a lot of wear and tear I would. You mentioned the ratios you used to make the paint, but how many pieces did you paint and how much total paint/plaster of Paris did you go through? I have 7 pieces of bedroom furniture to paint. Yikes!! For my bed, armoire and night stands I used about 4 times the initial measurements. Beautiful! What kind of wax? Just finished painting a bedroom set but it feels tacky and unset. I used Minwax furniture wax. So BEAUTIFUL!!! (And I do the same thing, wait till hubs leaves for the weekend and do a big project- but I’m usually never done when he gets back ???? But he sure does brag about my abilities when it’s all done so it’s okay I suppose!) I’ll be doing this to my coffee tables and end tables soon, I can’t wait now ???? Thanks for the tips!! Yep! My hubby ends up bragging about it too. I know he would have been okay with me doing it, but sometimes I dont want to have to convince him! Ha! Is the plaster of Paris a premixed product or powder? Can’t wait to do this. Thx! It is a powder. Good luck! I love how your bedroom furniture came out and I want to try doing the same to mine. The wood color is similar if not the same, but I just wanted to double check on the exact materials you used only because the links have a few different options (mainly in colors). White Latex Paint: This one I mainly want to make sure I get the correct type – your link brings you to an item that says “EZ8-GL EZ8-1G EasyCare Paint/Primer in One Off White Interior Eggshell Latex Enamel, 1-Gallon,” but it’s currently not available on Amazon. I found “EZSE8-GL EasyCare Paint/Primer in One Off White, 1-Gallon.” However, I wanted to see if this is a big difference since it doesn’t mention “eggshell latex enamel” in the title and has “satin” where yours has “eggshell” on the top of the label. Laura, yes you can use any finish of paint as long as it is water based. The eggshell and satin are just the sheen in the paint. The Plaster of Paris will take the sheen out anyways. You can also use any color that you want, that will not change the paint effect. Sorry, I must have typed it wrong! Its the 1/3 water 1/3 plaster of paris and 1 cup paint. You have two different recipes for the paint. Could you please advise which you used? First one is 1 cup, 1/2 cup, 1/2 cup then later on you said it was 1 cup, 1/3 cup, 1/3 cup. Absolutely love what you did! Can the Chalk paint needed to paint the furniture be purchased? I like the idea of painting my own furniture, but am nervous about mixing anything. Beautiful work! I noticed that you did not mention anything about sanding the entire pieces after painting. Just distressing. Do you not need to sand? Also does this have anything to do with using Plaster of Paris as opposed to calcium carbonate? I have never NOT sanded a piece so I was wondering if the look or feel is different. Thank you. No I did not sand the entire piece The paint is actually quite smooth. I find it good just to distress it. I want to do this with my tv stand. I have seen people paint things white before and then put polyurethane on it and then it turn yellow later on. Does the wax keep it from yellowing? Also, what did you use to clean the furniture before you painted it? It looks great! What kind of wax did you use? I have never done this, but I’m seriously considering. Getting ready to do a master bedroom redo this winter! Thanks! I love your furniture makeover! You talk about buffing after waxing, is this just wiping off the excess wax with a clean towel that is wet or dry? I have only painted end tables with chalk paint and did not buff them after the wax! You use a clean, dry towel and rub the wax and it will create a nice sheen. Hi! Question! My headboard looks very similar to yours, I want to do what you did but with a light brown instead of a white, so am I crazy? Or would it also look very rustic/chick if I just left it how you have it inthe oicture with your sister? And just distressed it a bit then did the wax/buff step??? Just me? You could definitely paint it in light brown. I would recommend doing one coat of paint first, and see if you like it. Then you can add one more coat if you think it needs more. However, I would say the paint is more strong and durable with more than one coat. My furniture is not solid wood, has that shiny faux wood finish. Do you think this would still work? Chalkpaint is perfect for that kind of wood. Mine did have a pretty glossy finish, not high gloss though. I would recommend doing some sanding if you are unsure. I noticed you didn’t sand or anything, that is my main concern. 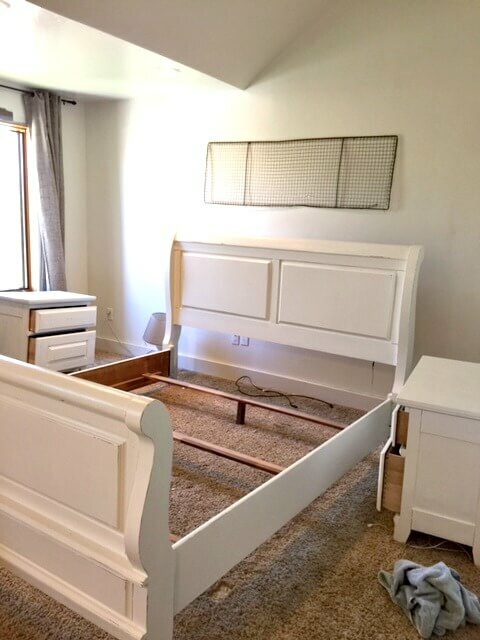 I want to paint my daughters trundle bed we got for free. It’s a cheery red oak and I hate that color. Question: can I use that mixture of paint on the bed and not distress it? Leave it white? I would love to hear from you soon! Hey Ana! You are too kind. Yes you could totally leave it white and not distress it. That is totally up to how you want it to look. Good luck! Your bedroom looks amazing. I have a question? White not spray paint? Could I use spray paint instead of a brush and paint? You could use spray paint, but you would have to use alot of it. Truly love the way this came out and you e inspired me to do the same! After reading all the comments, i wanted to ask: is the final product 1/3 1/3 and a cup? – also, I wanted to paint mine a light gray. Would I need to find paint in light gray water based or how do i purchase the paint? -last- once paint is dry- I scuff and apply wax and done? This is an awesome post! I am eyeing my bedroom furniture right now and it’s definitely time for a change! Hi I love your work, you are so creative. 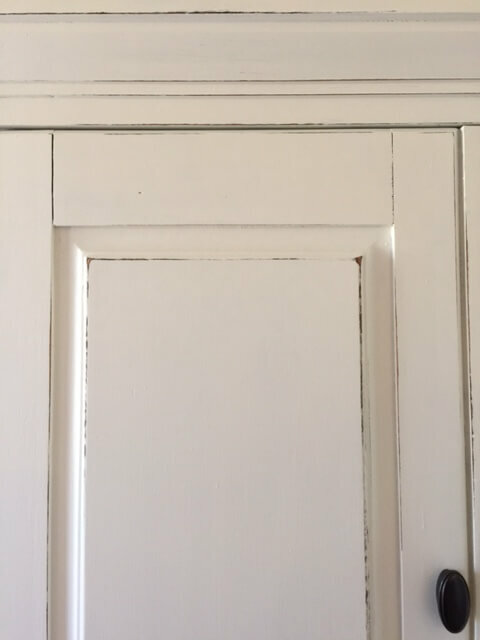 I would like to refinish my kitchen cupboards but they are made from MDF (medium density fibreboard). Would your process still work the same? Have you tried any projects made from this product? Do they have a finish or coating on them? Like Melamine? Or are they raw MDF? If they are raw, then this would definitely work the same! If it is has a finish on them, you may need to rough them up a bit before painting depending on the finish. SO SORRY! 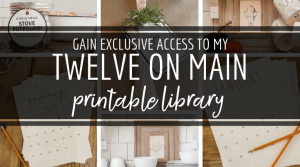 There seem to be A LOT of recipes if you read the post and ALL the questions … can you post one more FORMAL time the correct ratios for the recipe before I wreck my bedroom furniture? LOL! This is the only recipe that is in my post. Enjoy! Regarding recipe, in reply’s 2 different recipes are cited. Hi there! I am so glad I found this post! I’ve been trying to figure out what to do with our bedroom for the last year and now I have inspiration! One question I have is how has it held up since painting? Any chipped paint or peeling? I’ve never used chalk paint before. My bedroom gets oddly dusty so I am always wiping my furniture down. In the past I have spray painted (mistake!) a dresser and couldn’t clean the dust off for whatever reason. Are you able to easily? Does it scratch easily? Hi! The furniture I painted has held up incredibly well! It has been almost 3 years and it has just a few small chips, which is from kids who are very hard on everything including our bedroom furniture. I love this.. I plan to do the same with my bedroom set. Where is your bedding from??? 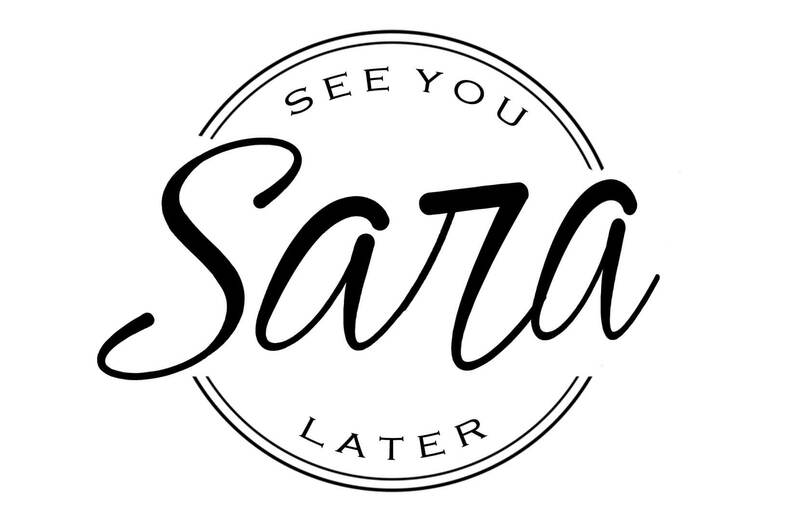 Sara, I have just recently discovered your blog, so I am really late telling you how I LOVE the paint job you did on your bedroom set! And, I couldn’t stop smiling about your “husband” technique; I have been doing this for years! Once when my husband was gone for two weeks on a job to Africa (TV cameran) I not only changed furniture, I changed rooms! When he came home,our bedroom was not in the same place! (But, it was in the same house!). Love you old ladder idea. In my livingroom we have an old paint spattered ladder (cut down) that my mother (now deceased) brought us when we were first married; we couldn’t afford one! Look forward to more of your ideas! I just found your post on Pinterest and was just telling my husband I want to paint our bed white!! He’s fine with it. Do you think this could be done in a day? I have a king size bed and would have my daughter help me. Yours came out beautiful!! Yes it could be done in a day! Thanks a bunch for this great idea , my bedroom set is actually black same style set you have . Think it will look ok distressingly it? Seriously considering painting my bedroom furniture! I love the shape & size of it but since we moved, the color is bugging me! It has a creamy yellow tone & would like it to be more white…thinking about it! Thanks for sharing! I like your way of thinking cause I think pretty much the same way except I don’t have a husband. I just like to change the look of things. You’re fantastic. I loved your post and your encouragement. I’m working on a few myself. But you’re room is beautiful and you should be very proud. And yes, I’m sure your husband is happy he has a savvy wife like you!!! But glad he’s gone when you “Do your thing”, as my husband says. He told me I can’t bring anymore projects home. Haha. I hide them in totes and stack stuff in front of other projects so he can’t tell what’s what!!!! I am new to all of this but after seeing how great yours looks am considering taking on the task for my bedroom. Before I do, I have a couple of questions. 1. If I choose to remove it later and restain, how difficult is it to remove? 2. My furniture is very similar style but the color is a dark reddish/mahogany color? Would this work with distressing or would I need to paint it another color first? I’ve read from others that the downside to using wax is if you ever want to repaint or do anything different with the furniture, you will have to get all the wax off. Have you ever redone anything after waxing it? No I havent ever painted over the wax. Hello! I’m so happy I came across your post! I’m looking into idoing the same with my dark dresser and nightstand. Your results have turned out beautifully!